Tonight, I got to step onto the bridge of a Federation starship. The U.S.S. Aegis (NX-1787) is fully equipped for deep space exploration, and I got to take the helm, target Klingon birds of prey, and energize the transporters. 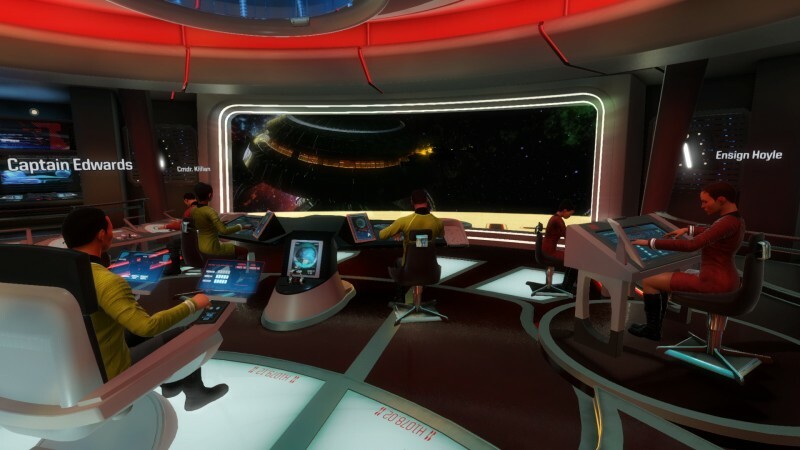 If you've played Space Team or Artemis, you'll feel right at home in a Star Trek Bridge Crew uniform. I had the fortune of playing the demo three times, taking on all but the Captain role (which was handled by a Red Storm team member). The game is based in the J.J. Abrams reboot universe, complete with lens flare. In the sample mission, our crew was tasked with warping to investigate a distress call at a space station orbiting a dying star. The captain has unique information, bringing up a message from Starfleet, directing helm to the appropriate mission location, and indicating to crew what is necessary to succeed. Upon arrival, the station is discovered to be heavily damaged. Escape pods with survivors are in the area. In order to rescue them, Tactical must scan them. This requires Helm to bring the Aegis close enough. Once scanned, shields must down to lock and engage the transporter. After bringing the first survivors aboard, a Klingon bird of prey decloaks. On the captain's orders, shields are raised, engineering diverts power to shields and phaser range, and tactical opens fire with phaser batteries and loaded torpedo tubes. Since shields need to be down to bring survivors aboard, the mission quickly becomes a juggle of defending against multiple birds of prey and using the transporters. Bringing the shields up too soon while beaming people aboard can kill them, as can ramming an escape pod. We learned that the hard way. The mission ends by warping out while under heavy fire. When the ship takes too much damage, NPCs on the bridge crew can die a fiery death. Each of the three stations I manned was an enjoyable experience that blended laughter with moments of intensity. The game is optimized for motion controls, but playable with a gamepad. It will be coming to Rift, Vive, and PlayStation VR. I demoed it with Rift and Oculus Touch controllers, which worked extremely well. The stations are all designed as touch panels and operating each, including the helm steering, was extremely easy and intuitive. 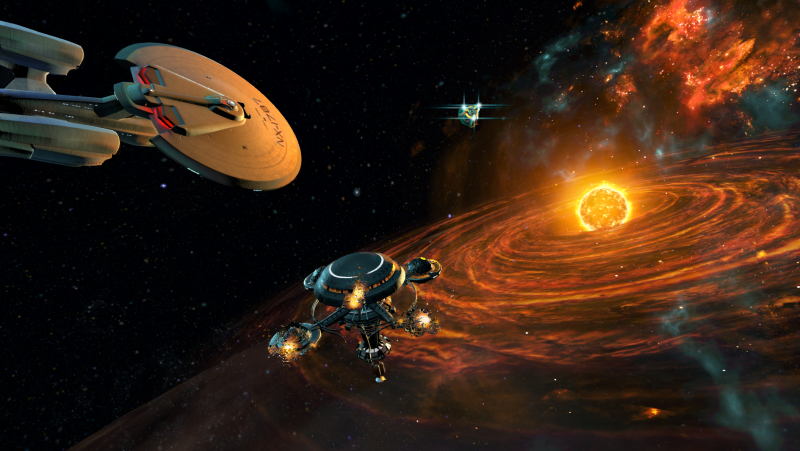 When Star Trek Bridge Crew launches this fall, it will support one to four players. If you're playing alone, you will do so as captain. You'll be able to hot-swap to other positions to execute more complicated maneuvers. There will be a story campaign, but also procedurally generated missions to keep players with more to do after finishing the scripted content. I'm very much looking forward to stepping back onto the bridge of the Aegis this fall. 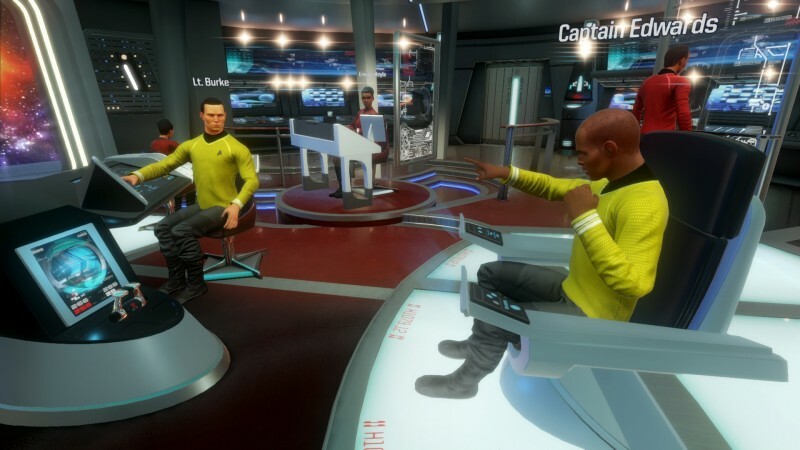 Ubisoft is going all-in on VR, and I hope it keeps delivering experiences like Werewolves Within (which I played at GDC) and Star Trek Bridge Crew.